Here's a quick guide to help you install Keysticks and use it for the first time. There's further information in the other online help topics and the help file that comes with the software. To install Keysticks, first download the installer program by clicking the Download button on the right. When the download is complete, double-click the installer to run it. Windows will ask you to confirm that you want to run it. Click Yes. 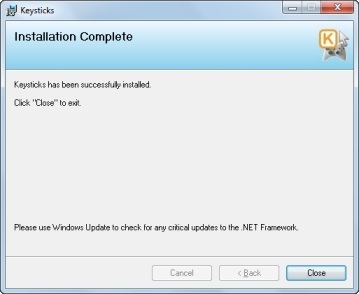 Next, follow the steps in the install wizard to complete the installation. You can start Keysticks by double-clicking the icon on your desktop, or by clicking Start and selecting All Programs - Keysticks. When you run Keysticks for the first time, you'll see the welcome screen shown below. If you wish, you can let the program load a recommended profile (P01) for you, or alternatively, just start with a blank set of controls. When Keysticks is running, you will see the controller window which is shaped like a gamepad and shows you what the controls do. The picture on the right shows the controls for the recommended profile P01. If your controller is connected, you'll be able to start using the controls. (If not, for more info about using your controller on Windows, see the Download page). The help file that accompanies the software suggests some sensible precautions, such as familiarising yourself with the controls before using them, and taking regular rest breaks, so please read those. You can also access the program menu by right-clicking the controller image. 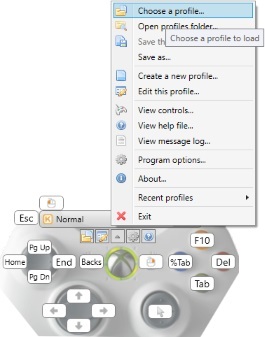 You can close or minimise the controller window if you wish: you'll still be able to access the program menu by clicking the Keysticks icon in the system tray. To exit Keysticks when you've finished, choose Exit from the program menu. To download Keysticks and try it yourself, click the Download button at the top of the page or visit the Download page.